When Nancy and her family arrive in Kona, Hawaii, they are desperate for a fresh start. Nancy's husband has cheated on her; they sleep in separate bedrooms and their twin sons have been acting out, setting off illegal fireworks. But Hawaii is paradise: they plant an orange tree in the yard; they share a bed once again and Nancy resolves to make a happy life for herself. She starts taking a yoga class and there she meets Ana, the charismatic teacher. Ana has short, black hair, a warm smile, and a hard-won wisdom that resonates deeply within Nancy. They are soon spending all their time together, sharing dinners, relaxing in Ana's hot tub, driving around Kona in the cute little car Ana helps Nancy buy. As Nancy grows closer and closer to Ana—skipping family dinners and leaving the twins to their own devices she feels a happiness and understanding unlike anything she's ever experienced, and she knows that she will do anything Ana asks of her. 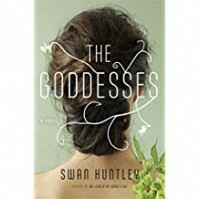 A mesmerizing story of friendship and manipulation set against the idyllic tropical world of the Big Island, The Goddesses is a stunning psychological novel by one of our most exciting young writers. This could be classified as an adult coming of age book in a way, and was quite strange. I was expecting more magical realism, but this was far more psychological than anything else. I wanted it to be more of a thriller, and I think it could have succeeded more if it embraced this category over women's fiction. The fascinating look at a sort of mid-life crisis going on was quite poignant, and the best part about this book was definitely seeing how Nancy's relationship with her husband evolved in relation to her own space in the world. The end made the book worth it, and the sort of sad feeling, but the lack of regret (to be ambiguous without spoiling) added more of an honest note to the novel. Overall, though, this book felt wondering, and I couldn't quite get absorbed into why I should care about what was going on.